I would also want to add that as a new player the game is quite difficult to get into. There are 3 tutorial missions, and I know some scenario's are more manageable than others, but something that would help to get into the game would be a string of scenarios or a campaign if you will that teaches the gameplay and that adds context to the individual scenarios. That might also help attract new players for who the learning curve might be to steep otherwise. Look, I'm dancing as fast as I can, okay? A history I did up a while back....was quite good at the time.. Status: offline I have a copy, but hard copy. Status: offline Its not on the DVD. I tried to get some numbers etc and Larry was helpful but it just got to be a chore that was no longer worth pursuing. I will however say, if the H2 Guide is being done in PDF then I am sure this one could also but I am not sure about copyright etc. I tried to get every version before Ultimate edition came out. Status: offline Well I'm not sure about copyright etc. either... I'm scanning it to convert into an ebook to take with me on holiday this Summer. Plus, I doubt anyone will have the patience to wait for and download every page I scan. Status: offline I am not worried about it, it is LONG out of print, and will never be reprinted. 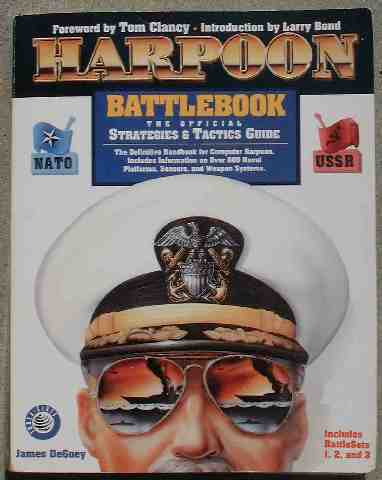 Status: offline Any chance the Battlebook as well as the Harpoon 2 Official Strategy Guide gets virtual? I own the Harpoon Ultimate Edition. 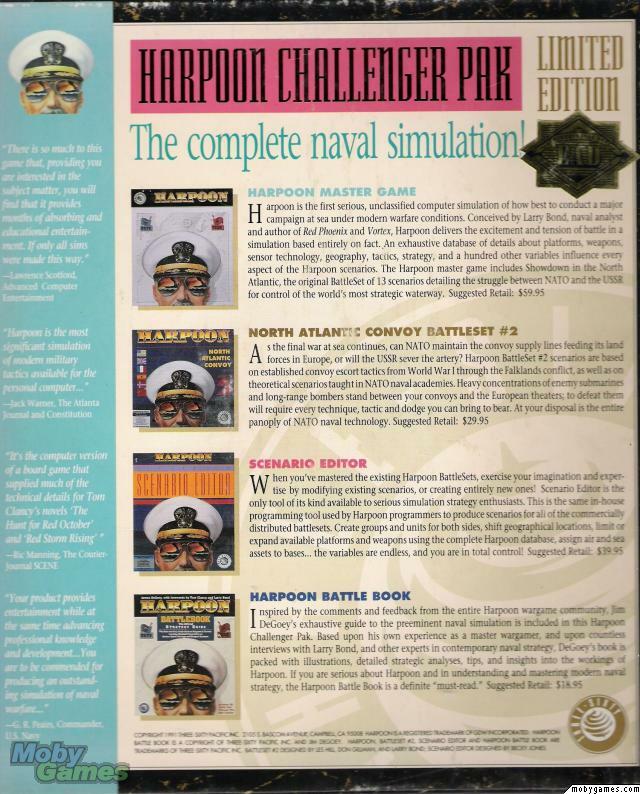 Lot's of manuals and I don't have a clue if the "Battlebook" and/or "Harpoon 2 Official Guide" is in them or not. I tried looking for these two but no chance. Google is full of fake-gargabe-sites. Well I'm not sure about copyright etc. either... I'm scanning it to convert into an ebook to take with me on holiday this Summer. Plus, I doubt anyone will have the patience to wait for and download every page I scan. Status: offline You might try eBay. I've found lots there. Thanks. Started with the release of the original Harpoon I (DOS based v1.0) back in 1989. Actually have a Windows 95/MS DOS 6.22 system, with 5.25" floppy drive, that it still plays on. I kept getting the updates and spinoffs after that. Hadn't heard about any new Harpoon stuff for a while so I went searching online about 2013 and that's when I discovered CMANO which turned out to be a superb, far more advanced, successor. I can't begin to compute the number of hours I've played both simulations! Status: offline There seems to be a lot of attention given here to how naval strategy and tactics would/should work within CMANO. As I recall the H4 strategy manual it was mainly about naval strategy, not as it applied directly within H4. If anyone is looking for a general naval tactics guide then "Fleet Tactics - theory and practice" by Capt Wayne P Hughes is an excellent text and a good introduction. It's available from the US Naval Institute bookshop, and probably elsewhere as well (e.g. Amazon). To relate that theory to the practical aspects of the game, then I agree the devs and an experienced ex- (or current) naval practitioner might collaborate on such a guide. We would need to bear in mind however that CMANO covers a large time frame, and tactics will vary over that time with weapons and sensors development. You might try eBay. I've found lots there. Not a bad idea but, sadly, I never really had an opportunity to get into the military boardgame world. I did have a fair amount of D&D "table top" gaming and greatly enjoyed that. Also, there is the matter of space! Already have two walls of shelves with gaming software!